A few months ago I got an email from Rhino Camera Gear asking if I would like to beta test their new slider. I didn't really know anything about this product and I quickly forgot about it until it showed up at our office a few days ago. I had no idea that this would be one of the most impressive products I've tested in years. I have way too many sliders. Some are too small, some are too long, some are too heavy, but most of them simply aren't smooth after a few months of use. I got my hands on the standard steel Rhino Slider a year or so ago and it quickly became my favorite. It is super small (but not too short), super light (because it's a rail system), and super smooth. In fact, I complained that it may actually be too smooth. Sliding a heavy camera feels totally frictionless. 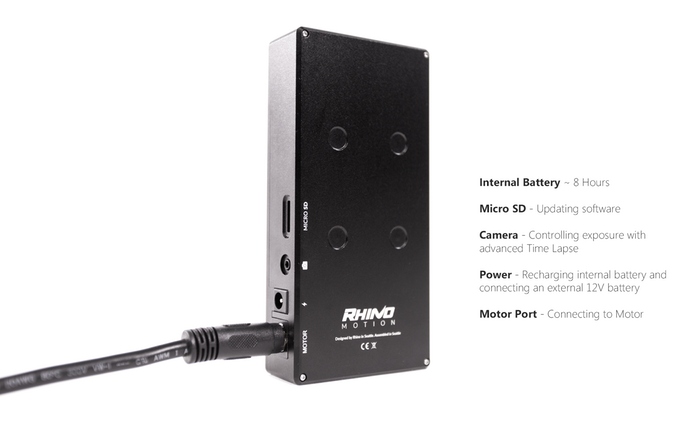 Before I opened the new Rhino Slider Evo beta unit that they sent me, I did a quick Google search and learned that this new slider has a mount for an electric motor. Automated movement is something that I am fairly accustom to being that I own a Red Rock One Man Crew and I've used many belt-driven sliders. I don't use the automated sliders very often though because they tend to be larger, heavier, and extremely complicated. I opened the slider first which was made of carbon fiber and was incredibly light compared to my steel slider by Rhino. The second box had just three things in it: a motor, a controller, and a power adapter. The motor slid into place and tightened with two screws and a single cable ran from the motor to the controller. Both the controller and motor were extremely robust. Some people (like me) will appreciate the incredible build quality of these parts while others will probably complain that they are way too heavy. The controller has a scroll wheel on the front that spins with a sensation that feels like "quality." This scroll wheel is also a button itself and can be pressed in to "select" or "OK" things in the menu. There is only one other button on the controller that takes you "back" to the previous screen in the menu. 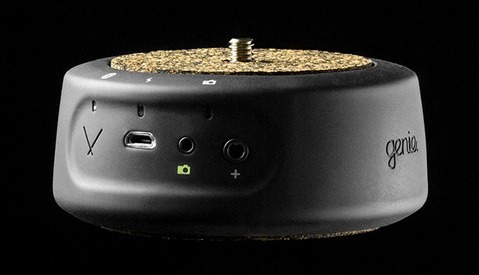 The controller is magnetic and snaps perfectly to the side of the motor when not in use. I powered on the controller, and without reading the manual I had figured out how to manually control the slider within a few seconds. Before each automated move the slider will calibrate itself, meaning that it will find the "end" of the rails. Once it does this, the carriage will never ram itself into the sides of the slider like so many other automated sliders do. While testing it out, I noticed a battery symbol in the upper right corner of the controller similar to the one on your smartphone. I unplugged the power cable and realized that the controller itself has a battery in it! This whole system can be used without AC power! I was impressed already but after realizing that this incredibly small package was completely self-sufficient, I realized how amazing it actually was. Obviously it has all of the standard time-lapse settings, but it presents them in such a simple and understandable way. Once you begin the time-lapse the controller will tell you what percentage complete the sequence is, how far it has moved, how much longer it has, etc. The two features that I was most excited to see were the "loop" and "ramp" options that have made my One Man Crew obsolete. Every year or two I am introduced to a product that is so well made that it makes an instant and lasting impression on me. The DJI Phantom was a game changer. The CamRanger worked so well it made me not want to actually use my camera. And the Rhino Slider Evo is so simple, so well made, so portable, and so powerful, I know it will completely change the way I shoot video. 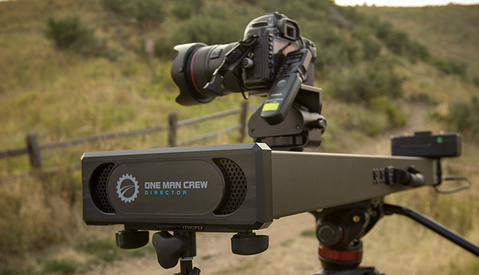 If you're in the market for a motorized slider, or maybe even if your not (I wasn't), you may seriously want to consider this product. Kyle Hart, the owner of Rhino, started this company from nothing just a couple of years ago via Kickstarter and I can't believe they have come this far. They've created a product so good that I honestly can't imagine what the competition will create to try to compete with it. Head over to their Kickstarter campaign now to get early access and help bring this killer product to market. It's frustrating that I can no longer be excited by a new product without people accusing me of being paid for it. There's probably no way I can convince you people that rhino has never paid us anything but it's the truth. I totally feel your pain. Best thing you can do...is change the title of of your reviews to "My Favorite new Toy: Featuring (insert product here)". Then at which point your article is set up in a way where you can passionately speak about your product with no judgement. Always includes some pros and cons if any. And honestly who cares what people think. Everyone who is negatively commenting read your entire article...which is the point anyway. Best part about it.....We'll all be back tomorrow to read some more. I love this site....I come several times a day. It's my morning newspaper! Can you please give us a detailed explanation on why you think this is an ad? I don't care if it is an ad. I like the review and think I'll buy it. Thanks Lee. Looks like it might be the solution I've been thinking about. Been wanting something small that I could grab and use on run and gun shoots for some extra movement but on productions where I have more time and for timelapse I want something longer. Then the repeat feature seems like it would be great for second camera for interviews where its just me shooting. plus it seems like a much better upgrade from the konova slider. By chance you wont have it with you at the Fstoppers workshop, would love to see it in action in person. Oh yes, we will definitely have this in the bahamas! Why wouldn't they add a feature to turn the camera as well? There is Rhino Parallax. Check Kickstarter page. seems a little short. I feel like 4ft should be the min to be a small slider. With 5-6ft being the standard for sliders. Regardless of the situation. Be nice if it could expand to larger slider. The rails exchange out every easily. They sell multiple lengths if you want to go with longer motions. Thanks Lee. I suspect I'm, like many others, still searching for that "perfect" slider, this one looks promising. I've already supported one of these products on Kickstarter (Axis 360 from Cinetics) which churned out to be a complete headache with faulty motors, extremely buggy software, and mind numbing motion controller. I've moved on to Syrp Magic Carpet and it's OK, just a bit flimsy but I'm manually moving it. I'll do a bit of homework and see if this one's worth the $$. Curious, have you tried it on a single tripod to see how much flex there is moving from one side to another? Seems like the battery really runs out quickly. Did you test the battery life? We did test the battery but that got cut from the video because it was becoming 20 mins long. Basically the battery will die running the carriage at full speed in about an hour. This seems totally reasonable since in 99% of the cases we would be using it for 2 mins at a time to get 1 perfect shot. If you need it for interviews you would just plug it in. I'm not sure how long it would last for timelapse when the carriage is moving very very slowly....but you can always plug it into an external battery too. For me, having any battery built is is already 1000x better than no battery. Ah. Yeah. I was thinking for timelapse purposes. I guess you have to have an external battery then. The product looks really good though! Great first look review Lee! However, at what point did you forget that we're on the Internet and you absolutely must... MUST!... show people and tell people how to click on a link to Kickstarter in your video, and show them how to scroll through all of the additional information there about this and their other products. PS. Dani Diamond - huge fan of your work, but feel shamed by that question! I'm not sure I understand your complaint...you can't click on the link in the article? Edelkrone slider with action module can accomplish all of the moves in a smaller package with a longer overall slide. There are some quirks with the edelkrone that make me want to switch to this one. If you're impressed by this one, you should definitely get your hands on Kessler Cineslider and Cinedrive/Second Shooter. 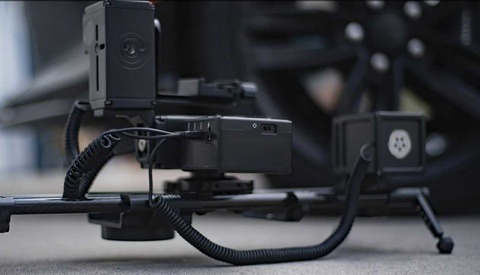 The design of Kessler Cineslider has been well thought out, considering the cart slides on the inner side of the rails making it less prone to bumps, if any. However, on the Rhino slider or any other slider, once you get any scuffs or marks/bumps on the outer rails - your slides are bound to become less smooth over time and it will show up in your videos. Also, Kessler is heavy duty and just overall solid in terms of build quality. We do have the stealth slider by Kessler....does that count? Pat: Stealth is lightweight & alright(has the same issue of cart sliding on the outer sides of the rail), but the build quality on Cineslider is wayy better. Don't take my word for it, better yet check it out in person when you get a chance. Exactly how many have you reviewed? Maybe a few links so we can compare for ourselves. Thanks for the review! Can you tell me what kind of head you're using in the video review?